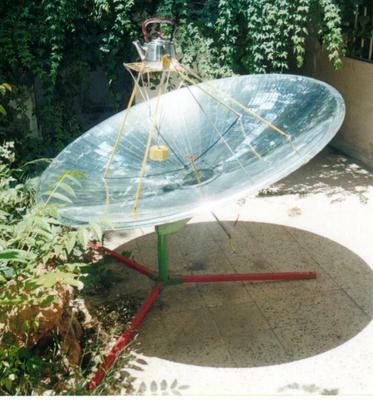 i have working on solar cookers since 1995, i have tried to use the dish of the satellite with 1.2 m diameter, it was very good but because the focus is out side the dish in about 60 cm, so i found it dangerous because it may damage the eyes when you work on it or sometimes when the sun go right the focus go left so it may touch a tree or something able to burn, so i turned to the deep focus type. in the photos you can see the 2 types which i have manufactured. Wow! these are really nice, great work! 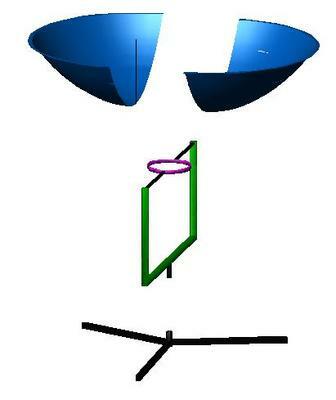 Yes, I know what you mean about the difference between the two types of parabolic cookers, the deep dish and the the shallow dish focus. I use both styles of cookers myself. 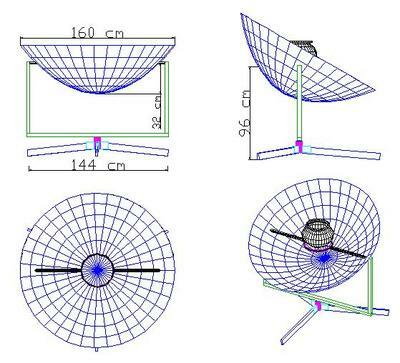 I like to use the deep dish and shallow dish parabolic. With the shallow dish I can cook with a more intense focal point, so I use this one more often for deep frying and pressure cooking, but both kinds work well for me. Thank you for the great photos and images. This is great information for our website visitors. I guess some would consider the parabolic dangerous, but I look at it like any other useful tool...one needs only to be careful with it and it will serve it's purpose well. Nevertheless, I too have had a few mishaps where I burned the stucco on my house and melted a few "innocent" by-standing objects. 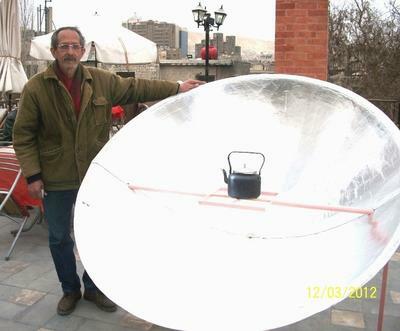 That is one reason we developed our industrial strength solar cooker protective covers to prevent such mishaps. I too have a shallow parabolic cooker and I have learned the hard way that I need to keep it pointed in a direction where it won't do harm. My avocado tree leaves have been burnt and a city trash can melted. In addition I once forgot my pressure cooker on top and burned off the handle. So yes please be careful when in use and also while not in use. thank you very much, yes you are right, the two type are well and the shallow focus can be better sometimes for special kind of cooking.